Plagiarism is being rapidly increasing due to no control gained by the publishers and authors, it is necessary to provide plagiarism free work before we get claimed about it. Either you are a website owners, Blogger, Researcher or marketer, it is important to control the redundancy in your work as you won’t get any reward if you submit as it is. Before you gain some extra amount of visitors to your Blog or website by publishing many posts, it is important to check back the old ones’ and find out is there anyone who copying and stealing your authorize work? And if yes then take an appropriate action to prevent the contents from being duplicating. 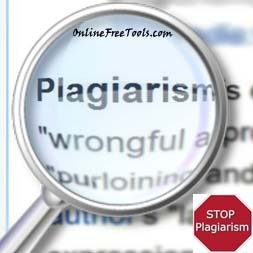 Before you submit the research paper it is necessary to check for plagiarism using free online tools. Technically, Plagiarism is the practice of stealing someone else work and acting as own work, generally plagiarism means copying, stealing someone idea or work and after doing some changes claiming own work. Did you get? For example if you’re a website owner or a blogger and someone just copy your contents and publish them on his own website or blog, then it’s called plagiarism. It may be your posts (articles), the design of your website or others. If you do -it must be via attribution and the credit given to the author. It also occur, when an author or researcher use someone ideas, contents without giving reference and credit. However if you are writing a research paper and you use someone other work but give reference then it’s not plagiarism. The work which has plagiarism possibility is called plagiarise and the person who does is called plagiarize. Here we are talking about online resource that are free and that check your work for originality. These tools pull the information you give them via a form, then using search engines APIs, search for the text and doing some special types of queries, if the result is not zero. Then it will give a report about the analysis they did. And they may also give you the deep analysis about plagiarism queries that are detected, which sentence they found to be redundant, how many times it is found duplicated. Similarly for words, finding the word density, how much times it is being found in a line within a sentence. Before you get a list of online tools to check plagiarism for free, I’d recommend giving me attention here. First of all the list of online tools here- are of various types. Such as checking the research paper for plagiarism or for a post (an article) or analyzing website contents. The one which is to your own interest you should use. These are the tools that check your paper for plagiarism. Such as Research paper, student work, teacher work, assignment work, homework, essays, reports, posts, articles etc. You may insert text into text area, or upload a file via choose file button option. You may want to check for grammar report or plagiarism report. Here are the list online tools to check paper for plagiarism. The more intelligent and sophisticated free online tools that get URL of the Post, Homepage, Web Page etc from you, and start analyzing them. Once the process completes, then you’ll get a report about found duplicated pages (Posts, web pages). It is important for website owner and Bloggers to avoid duplication and scan their contents weekly, because Google penalize such blogs. Here’s the tools to check Website contents for plagiarism. https://www.dmca.com/Scan (You’ll have to create an account, Try it (Recommended by OnlineFreeTools)). How do I Control Plagiarism for future? It hurts when you see someone get top position and copied your own article, to my Blogger friends, I’d recommend DMCA Free Scan. Now there’s a question, how to control plagiarism? Because if you scan a research paper or other offline work then you detect duplication and resolve the issue, now what if it is online work, such as website contents, articles, post etc, even if you scan your website for once and resolved the issue, then may be in the upcoming time someone else or the same person again copy. Depending on the time you give to your work (Business). I’d recommend and advice- to use online tools to scan your website contents weekly. Awesome I am looking for these tools! Great post! Its very helpful. Awesome work bro keep it up !!!!!!!! !